I found this great article written by the editors of fashionbean. Perfect for the summer and more importantly, great suggestions on how to go sockless. Swapping socks for skin is something that’s become increasingly commonplace since designers like Thom Browne took to dramatically cropping suit trousers back in the mid-to-late noughties. While many have been quick to call peak-mankle on the trend, it’s a look that only seems to rise in line with the mercury. 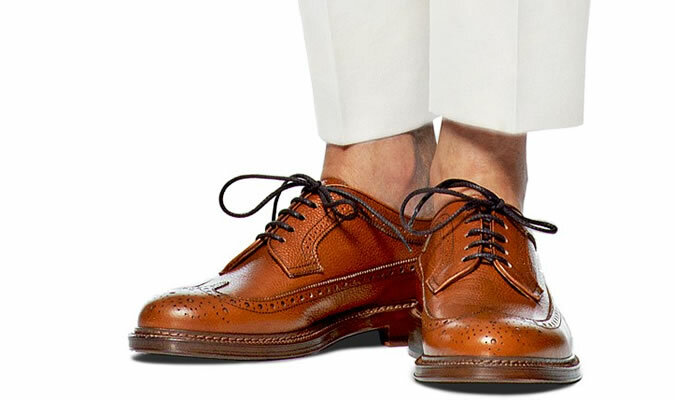 So here’s everything you need to know about the spring/summer style phenomenon of going sockless. To mankle or not to mankle isn’t the only question that men face. Despite making the switch from fashion jargon to bona fide style move, the specifics of how to do it can still be confusing. Essentially, there are four key techniques for pulling off the look; each one best suited to a specific trouser type – be it jeans, chinos or smart trousers – and desired finish. Especially popular with sneakerheads, the pin roll delivers a slightly tighter, cuffed look. Achieving this involves pinching the excess fabric on the inside of the leg and folding it back against the ankle before rolling over onto itself to secure. An ideal option for styling jeans, not only does the elevated hem allow you to show off those new limited-edition kicks, it also helps stop the dye of raw denim bleeding onto your footwear. Win-win. Top level dos and don’ts: barbeques, summer weddings, business-casual offices-yes. Funerals, court appearances, Interviews, board meetings – no. Simple enough.